Scientists have drawn up a list of the 100 biggest questions regarding uk's environment. 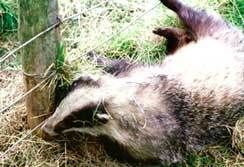 These include controversies pertaining to allowing farmers to kill badgers to protect their cattle from disease, and the number of seabirds slaughtered by wind farms. The list is based on suggestions of more than 650 experts in universities, conservation groups and government institutes. It's intended to inform policy-makers and steer research over the next decade to answer key questions in areas such as farming, climate change, pollution and urban development. The list asks whether there is evidence that organic farms are better for the environment, revisits the problem of whether badgers spread bovine tuberculosis to cattle and raises the thorny issue of the damage that domestic cats might be doing to animal populations a long-standing question that ecologists rarely voice lest they anger the uk's pet owners. Bill Sutherland, of the University of East Anglia who led the exercise, said "Scientists tend to think that policy-makers ignore the science and this was an attempt to narrow that gap."